As the capital of a historically Catholic country, Paris has a wonderful legacy of glorious churches. The famous quote, "Paris is worth a mass" (attributed to King Henry IV) reveals much about the religious heritage and cultural value of the city. Today, anyone can appreciate the sacred beauty of the city's magnificent churches, which provide welcome spaces for meditative retreat and spiritual inspiration. Visiting Paris' most important churches offers a glimpse into the city's finest art and architecture as well as its religious life. The Cathedral of Notre-Dame astounds visitors with its immense proportions and Gothic splendor. Other churches boast exquisite interiors and opulent facades, such as Sainte-Chapelle with its marvelous stained-glass windows, the Eglise Saint-Sulpice with a gorgeous Baroque exterior, and the Sacré-Coeur that stands at the highest point in Paris as a beacon of faith. For those with a secular point of view, the churches on this list are splendid historic monuments. Many of the churches also host organ concerts and classical music festivals. The most famous church in Paris stands in the heart of Paris on the Île de la Cité, an island in the Seine River near the Latin Quarter. Tourists flock to this area to see the Notre-Dame, one of the city's top attractions. This magnificent cathedral draws crowds that stand before the building in awe of the abundance of Gothic gargoyles and flying buttresses. The 12th-century cathedral was built on the foundations of a Merovingian church of the 6th century. The foundation stone of the cathedral was laid in 1163 by King Louis IX (Saint Louis) and Bishop Maurice de Sully. The building of Notre-Dame extended over 150 years, during which all the various phases of Gothic architecture-from the great cathedrals of Chartres, Reims, and Amiens-were reflected in its structure. The interior exemplifies the grandeur of Gothic architecture with its space. The immense vaulted nave and many illuminated candles provide a sacred aura. Both the choir and the nave were built in Early Gothic style. As at the Saint-Denis Cathedral outside of Paris, the great 19th-century restorer Viollet-le-Duc renovated the cathedral from 1841 to 1864. A sparkling gem among Paris monuments, Sainte-Chapelle is a palace chapel that was built for King Louis IX. This marvel of Flamboyant Gothic architecture was constructed from 1245 to 1248 featuring a gilded 76-meter-high vaulted nave filled with exquisite stained-glass windows. These celebrated stained-glass windows depict scenes of Heavenly Jerusalem, while filtering light into the sanctuary. Visitors are stunned by the impression of a glowing sanctuary, which looks like a veritable jewel box illuminated by the colored glass and chandeliers. The chapel was built to house the precious Christian relics, which King Louis IX had acquired from the Byzantine Emperor (which had cost him two and a half times as much as the building of the chapel). Sainte-Chapelle is only rarely used for worship on very special occasions, but is frequently used for classical music concerts. Sainte-Chapelle is in the large inner courtyard near the entrance to the Palais de Justice. To reach the chapel, turn left immediately inside the large iron gate at the main entrance to the Palais de Justice building. The Palais de Justice stands on the site of the former royal palace (residence of the French Kings), which reached its peak of magnificence during the reign of Louis IX when Sainte-Chapelle was built. However after the French Revolution, the royal palace suffered damage and the site became the Palais de Justice, used for the citizens' court. Most of the present building was constructed in the 18th century under the reign of Louis XVI. The elegant Baroque church of Saint-Sulpice stands in a graceful fountain-adorned square in the 6th arrondissement, a charming neighborhood with many wonderful pastry shops, cafés, and boutiques. The Eglise Saint-Sulpice was founded in 1634 by the Abbey of Saint-Germain-des-Prés as a new parish church. The plain facade, modeled on Wren's St. Paul's Cathedral in London, was the work of Florentine architect G. N. Servandoni. With its double row of columns, the facade is a rare example of simple, unadorned classicism. The interior is a masterpiece of classic French style designed by the architect Gittard in 1660. The nave has a barrel-vaulted roof that creates the impression of spaciousness, enhanced by the tall windows that allow light to filter into the sanctuary. In the first side chapel are frescoes by Eugène Delacroix depicting the Archangel Michael's fight with the dragon, the expulsion of Heliodorus from the Temple, and Jacob wrestling with the angel. Saint-Sulpice Church has a renowned 18th-century Clicquot organ, and the church regularly hosts organ concerts. Just a few steps away from the church are the renowned pastry shops: Pâtisserie Pierre Hermé (72 Rue Bonaparte) and Pâtisserie Gérard-Mulot (76 Rue de Seine) where visitors can sample the finest desserts in Paris. The Basilica of the Sacred Heart is one of the great Paris landmarks, standing high above the city on the Butte Montmartre. Parisians fondly refer to this church as the "Wedding Cake" because of the gleaming alabaster domes and decorative detailing that resembles frosting. This Romanesque and Byzantine style structure was modeled on the church of Saint-Front in Périgueux. The church was built as a symbol of reconciliation and hope after France's defeat in the Franco-Prussian War. The basilica has a spacious and ornately decorated interior, and the central focus is a large glittering mosaic of Christ with a flaming heart. To arrive at the Sacré-Coeur, visitors can walk through the quaint cobblestone streets of Montmartre's old artist neighborhood around the Place du Tertre to arrive at 35 Rue du Chevalier-de-la-Barre, the back entrance of the Basilica. Another option is to climb the steep flight of steps that begins at the Rue du Cardinal Dubois (or take the funicular from here). From the esplanade in front of the Basilica, there are sweeping panoramic views of Paris. Visitors may also climb the 300 steps of the Basilica's dome (for an admission fee) to take in the view from a higher perspective. The oldest church in Paris, the Church of Saint-Germain-des-Prés is in the 6th arrondissement near the lively Boulevard Saint-Germain with its legendary café scene. The history of this ancient edifice dates back to the 6th century when the Merovingian King Childebert built the Basilique Sainte-Croix et Sainte-Vincente, which was later destroyed by the Vikings. The early church contained the tombs of Merovingian Kings. In the 11th century, the church was rebuilt by the Abbot Morard of a wealthy Benedictine Abbey and dedicated to Saint Germain, a bishop of Paris who was canonized in 754. In the 12th century, Pope Alexander III consecrated the church's new choir. The church was plundered during the French Revolution, however it was renovated in the 19th century. The simple exterior of the church does not prepare visitors for the grandeur of the church interior. The Romanesque nave features columns with gilded decorative details, while the choir, with its circular plan, incorporates some marble pillars from the Merovingian basilica. The overall effect of the sanctuary is an inspiring sacred ambience. The Eglise Saint-Germain-des-Prés regularly hosts classical music concerts that are open to the public. The original church of Saint-Germain l'Auxerrois was destroyed during the Norman siege of Paris in the 9th century. This spectacular Gothic church was then rebuilt in the 11th century and remodeled in the 12th century. Exemplifying elegant High Gothic architecture, the bell tower is a beacon to the faithful. The interior has a serene ambience with its high vaulted ceiling and windows that allow light in, while the Flamboyant Gothic choir offers an inspiring space for spiritual meditation and prayer. The exterior porch features graceful arches and stone statues including the Virgin, Saint Germain, Saint Genevieve, and the Archangel Michael. The church has retained some of the original 16th-century stained-glass windows, which depict scenes in the life of Christ, Saint Sixtus, and Saint Vincent. Among the many sculptures in the church, the most noteworthy is the 13th-century sculpture of Saint Germanus of Auxerre in Burgundy. There are also two exquisite altarpieces from the 16th century. The church was significantly renovated in the 17th and 18th centuries. The Eglise Saint-Séverin-Saint-Nicolas is in the atmospheric Quartier Latin, the medieval quarter of Paris. The church is named after the hermit Severinus who lived here in the 6th century. Similar to the Eglise Saint-Germain-des-Prés, this church was also built on the site of an Early Christian chapel, which was destroyed by the Norsemen. The present church, begun in the 13th century and completed in the 15th century, is one of the finest examples of Flamboyant Late Gothic architecture. Visitors are astounded by the brilliance of the interior, with lavish 14th-century stained-glass windows featuring figures of the Apostles. Other windows date from the 15th century as well as a few modern windows in the choir created by Jean Bazaine in 1966. The first three bays of the nave are in the simple style of the 13th century. The choir, with a double ambulatory and intricate vaulting, is a masterpiece of Late Gothic architecture. The church boasts an excellent 18th-century organ. A visit to the church could be combined with one of the organ recitals regularly performed here. There is also a pleasant garden on the site of the old graveyard. The Eglise Saint-Eustache is dedicated to the Early Christian martyr Eustachius (Eustache) who was the patron saint of hunters. Saint-Eustache Church was the last church in Paris to be built in the Gothic style before the Renaissance began. The foundation-stone of the church was laid in 1532 during the reign of King François I, but the church was not completed until 1640. The cruciform floor plan and the net vaulting (similar to the Notre-Dame) are Gothic features, whereas columns and pilasters that face the piers are Renaissance style. 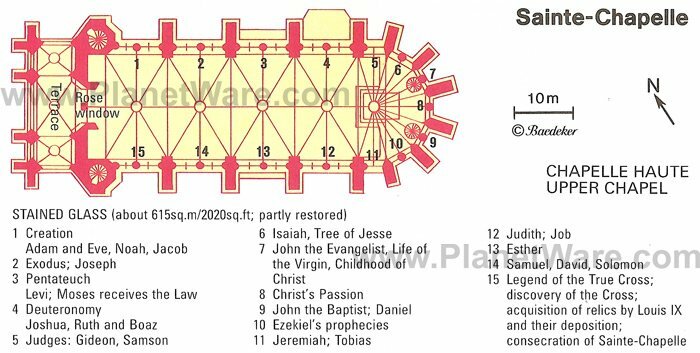 The church was designed with impressive dimensions of 88 meters in length and a height of 34 meters to accommodate the large size of the parish. Lovely 17th-century stained-glass windows illuminate the spacious sanctuary. Especially noteworthy are windows in the choir by Philippe de Champaigne (1631) depicting the Apostles, the Fathers of the Church, and Saint Eustache. The painting of the Saint's martyrdom by Simon Vouet (1635) is also striking. Famed for its superb Ducroquet-Gonzalès organ, the church hosts regular organ recitals and music festivals. Saint-Eustache is the ancient parish church of Paris' Les Halles-Beaubourg district. This area at the center of Paris used to have many traditional market halls, explaining the name "Les Halles" (The Halls). Today, the old market halls have been torn down and replaced with modern urban planning and a shopping mall. The lovely Baroque church of Val-de-Grâce is part of a well-preserved 17th-century convent, now a military hospital. Anne of Austria, King Louis XIII's wife, purchased the convent buildings and presented them to a house of Benedictine nuns, vowing to give them a church if she gave birth to an heir to the throne. In 1638 she had a son, the future King Louis XIV, and in 1645 she fulfilled her vow, commissioning Jacques Lemercier to build the church, which was completed by Gabriel Le Duc in 1667. The church's design was strongly influenced by the Italian architecture in Rome, the great center of 17th-century Baroque architecture. Lemercier modeled the front on the Church of Santa Susanna in Rome with its double row of columns, while the dome was inspired by Saint Peter's in Rome. The interior has a barrel-vaulted nave with three side chapels. Decorative features include the round-headed arches with reliefs of the Virtues and medallions depicting the Forefathers of Christ. In the dome, there is a resplendent fresco by Pierre Mignard (1665) of God the Father surrounded by saints and martyrs. The church has an excellent Cavaillé-Coll organ and a strong musical tradition. Classical music concerts are still held here regularly. The Church of Saint-Etienne-du-Mont was founded in 1492 for the servants of the Benedictine monastery, which once stood on this site. Although the church is dedicated to Paris' patron saint Stephen (Etienne), Saint Genevieve, who saved the city from destruction by Attila the Hun, is also venerated here. The area round the church is named the Montagne Sainte-Geneviève after her. Because of the church's prestigious heritage, men of importance have been entombed here, including the philosopher Blaise Pascal and the dramatist Jean Racine. The church also possesses the sarcophagus, which is said to contain a stone from the tomb of Saint Genevieve. The church was constructed during the Late Gothic period to the Renaissance, which is reflected in its architecture. Visitors are delighted by the unusual interior with a famed rood screen by Philibert de l'Orme, dramatic spiral staircases, and ornate Gothic vaulting over the crossing. The Renaissance-era round pillars add to a sense of harmony. The sanctuary is illuminated by dazzling stained-glass windows of the 16th century and 17th century depicting the Apocalypse and the Parable of the Marriage Feast. The richly decorated exterior, except for a 13th-century turret, is a masterpiece of Renaissance craftsmanship. Known simply as "La Madeleine," the Eglise Sainte-Marie-Madeleine is an atypical church built to resemble a classical temple of ancient Greece. The grandiose building boasts a considerable size at 108 meters long by 43 meters wide. The foundation stone of a Baroque church was laid in 1763. During the reign of Louis XVI, it was decided to alter the plan to a Neoclassical church on the model of the Panthéon to give more prominence to the dome. The impressive classical-style exterior features 54 Corinthian columns and reliefs of the Ten Commandments and the Last Judgment. Upon entering, the beauty of the opulent interior dazzles viewers with its fine decor and elaborate gilded detailing. Three domes allow light to stream into the sanctuary, creating a serene effect. Noteworthy works of art include reliefs of the 12 Apostles, a 19th-century Baptism of Christ sculpture, and a marble group on the high altar representing the assumption of Mary Magdalene into heaven. A sumptuous fresco depicts Constantine the Great, Joan of Arc, Saint Louis, Michelangelo, Raphael, Dante, Napoleon, and other leading figures. The church has a famous Cavaillé-Coll organ, which is still used for music recitals. Near the most famous ice cream parlor in Paris, Maison Berthillon (29-31 Rue Saint-Louis en l'Île), this fascinating historic church is worth a visit while exploring the quaint cobblestone streets of the Île Saint-Louis. From Berthillon, the church is only a few minutes' walk away. The Eglise Saint-Louis en l'Île was founded in 1664 and designed in the Baroque style by the architects Louis Le Vau and Gabriel Le Duc, however the history of its relics dates back further. The church is dedicated to Saint Louis, King of France (Louis IX) who reigned from 1226 to 1270 and came to pray on the Île Saint-Louis, which at the time was covered with fields where cows grazed. From this location in 1269, the King set out to join his Knights on the Crusades to defend Jerusalem. Along the way, Louis bought the Emperor Baldwin II of Constantinople's relic of the crown of thorns; this is displayed on the statue placed in the organ loft. Because the King procured these precious relics from the Crusades, this church would later become a sacred monument.